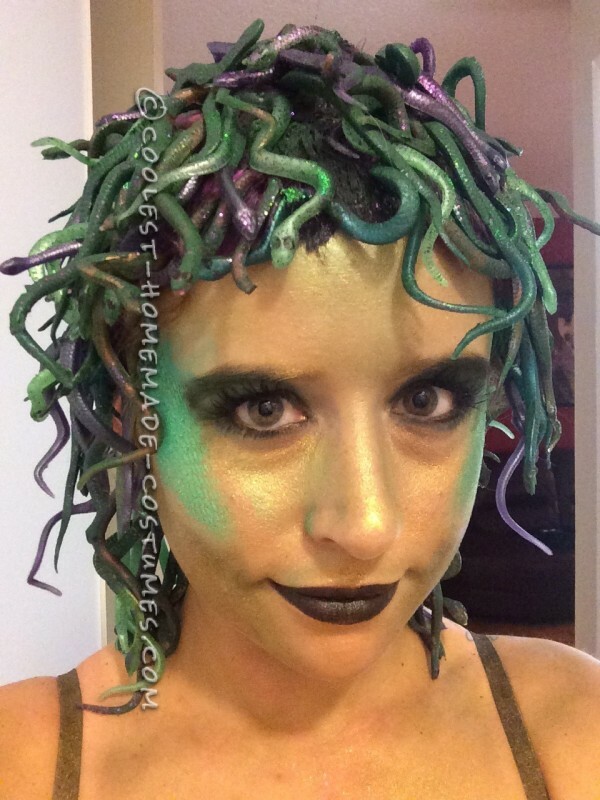 Medusa… Let me turn you to stone! I really loved how this costume came out. I received a lot of compliments and everyone had to touch my wig! They wanted to know what it was made of as they all jiggled and wiggled! Just like real snakes. I dont have any close ups of my bra, the skirt, body chain or the snake skin cuffs and choker that I made for the costume. I have a hobby making jewelry so I made the cuffs and choker out of real snake skin. I also made the body chain, though that did not last the night! The Wig. The Meat & Potatoes of the Costume. I bought over 20 packs of neon snakes from a dollar store. I then painted them all green with a purple glitter so they sparkled. I also dotted eyes on each snake. I took a wig and chopped off all the hair. Which ended up everywhere. 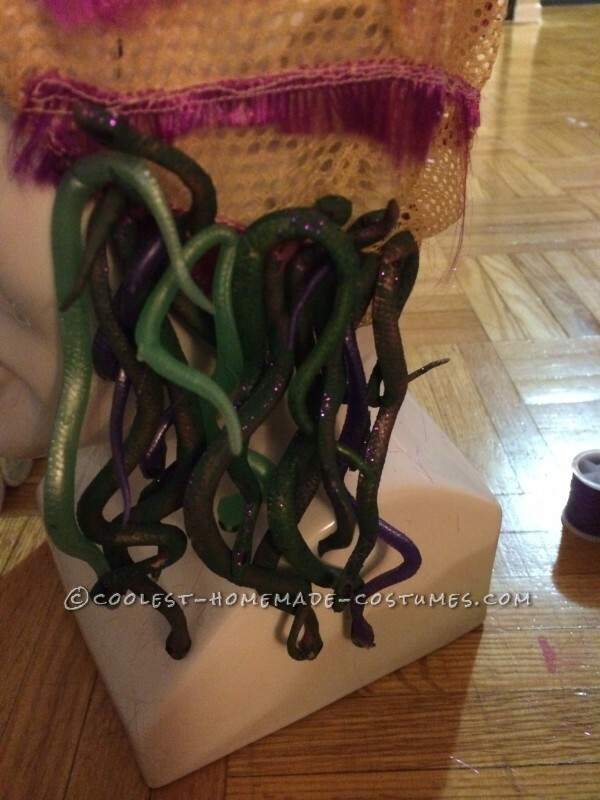 I then sewed on over 150 snakes to the wig. I also painted the wig green so you couldn’t see my hair underneath. 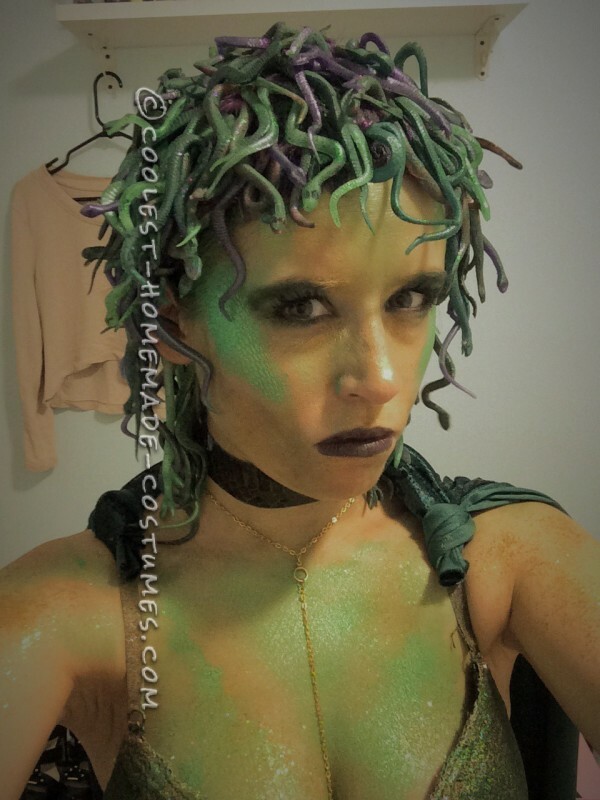 I really loved the wig as it jiggled every time I moved my head, Just like real live snakes! Hiss Hiss. 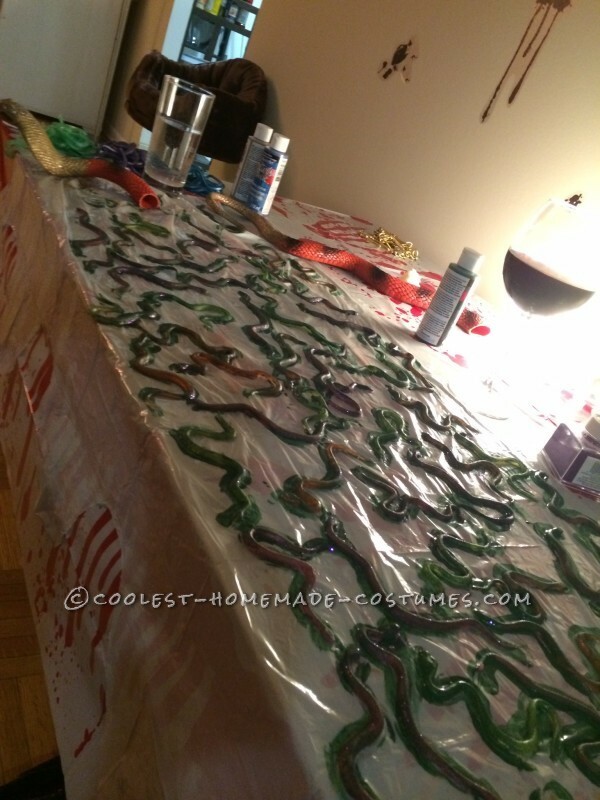 It took about 5-6 hours to sew all the snakes on and that’s not counting how long it took to paint them all. I originally made the bra purple, then I realized with the snake like fabric I had that I would look like the little mermaid! So I decided to redo it. About 10 layers of glitter later I had a gold/green/black glittered bra. 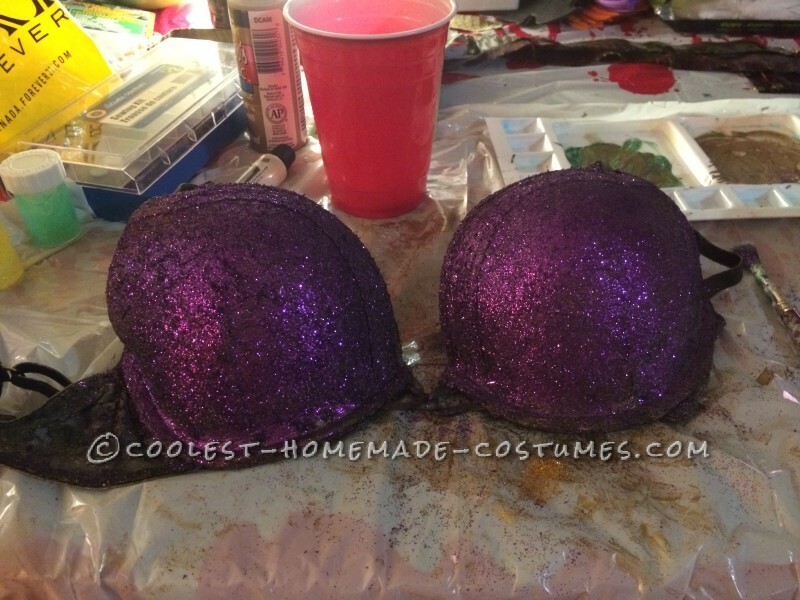 I mixed the glitter with gold paint so that the straps matched the cup. After all those layers it was hard as rock! 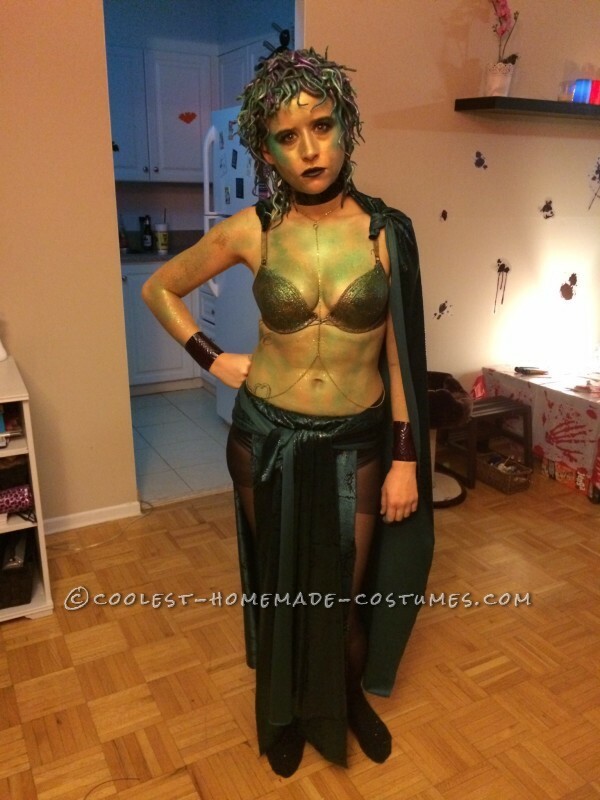 I wanted to make my Medusa costume look as Greek as possible as she is from Greek mythology. For the skirt, I cut it in three pieces. I tied the front flap to a belt and then tied the front flap to the front of the belt. I had lost all my needles and it was the night of Halloween! So I had to improvise. Next I wrapped the longest piece around my waist to cover the knots and hold it all up. For a cape, I caught a big piece of fabric and just tied it to my bra straps. I was really surprised that my skirt survived dancing all night! Originally my roommate, a makeup artist was supposed to do it but then last minute, I was abandoned to my own devices. It was interesting to say the least. I used green eye shadow and gold cream eye shadow for my base and body “paint”. Then I used green dollarama hair spray and fish net tights to create scales on my face, chest and belly. I had my cape to cover my back! It was really interesting doing the scales by myself. Lets just say I got hair spray in my eyes a few times. As I had to hold a piece fish net with my mouth and one hand while spraying the hair spray with the other hand! I am super proud that it came out so well. I was shocked. I only know how to do basic makeup. It’s not usually my forte.